Among the founding principles of Wawa, one clearly stands out: our ongoing commitment to giving back to the communities where we do business. Our company and our associates continuously seek out opportunities to make us the best neighbor we can be. This is evidenced by corporate and regional efforts, and through our associates who make our "good neighbor" philosophy alive and well in all of our business communities. Like everyone else, our support is limited, but we do offer a variety of giving and fundraising programs to our neighbors and communities. is a 501(c)(3) non-profit corporation* founded by Wawa, Inc. to support all of Wawa’s charitable giving and philanthropic activities. Through the Wawa Foundation, Wawa will have the opportunity to create even more positive change and awareness for its community partners. To learn more about The Wawa Foundation, our areas of focus and our commitment to help build happier, stronger communities, please visit www.TheWawaFoundation.org. *The Wawa Foundation Inc.’s non-profit status is pending approval by the Internal Revenue Service. Our Fundraising Program is available to community-based, non-profit 501(c)(3) organizations looking for a fun, easy way to raise money for important causes. 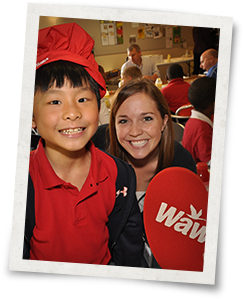 Learn more about Wawa’s fundraising program.